On May 20, 1847, Dr. Crawford W. Long was called to see a child residing 6 miles outside of Jefferson, Georgia, who had been bitten by an insect four hours earlier. He was at least 100 yards away when he “distinctly heard her screams”. The child was in extreme pain and suffering from various symptoms, including stomach cramps, difficulty breathing, chest pain, and muscle spasms in the abdomen. The family had given her “about half pint of brandy … two portions of sen[e]ka snake root boiled in ^sweet^ milk and … two teaspoons full of Aqua ammonia, but all without the least benefit”. Dr. Long administered “eighty drops Tinct Opii, a teaspoonful of Hoffmans Anodyne, and the application of the strong Aqua ammonia on a pledget of cloth to the bitten part and retaining it until vesication was produced”. After seeing some improvement, he continued with doses of Hoffman’s Anodyne and the Tincture of Opium in thirty minute intervals, noting the patient was “greatly relieved”. The preferred remedy, primarily a combination of Hoffman’s Anodyne and opium tincture, worked as an anti-spasmodic and a pain-killer. Hoffman’s Anondyne was a compound sometimes known as “Spirit of Ether”, produced through a process of distillation. Though originally named after the German physician Friedrich Hoffmann (1660- 1742), the recipe was still popular across Europe and the US during the mid-19th century. 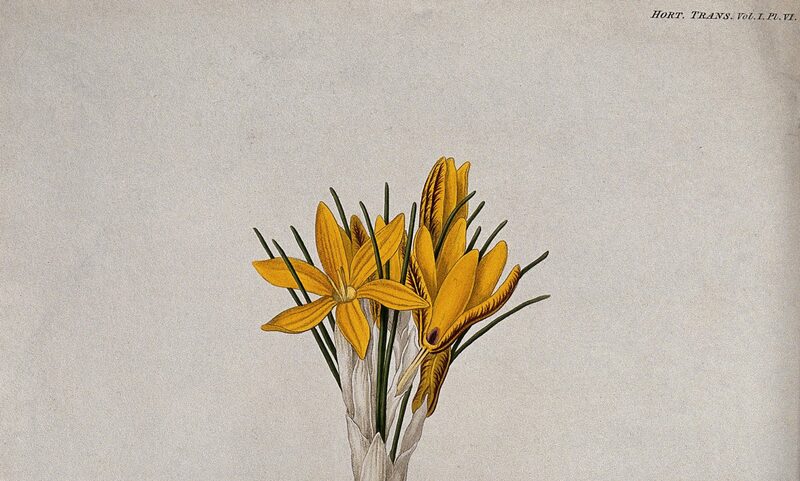 One 1850s pharmaceutical study of the remedy’s chemical properties found that versions of it varied greatly between commercial manufacturers, between international pharmacopoeia, and from Hoffman’s original recipe. Dr. Crawford Williamson Long (1815-78), an American surgeon and anesthetist, is one of the first physicians to have administered ether as an anesthesia for surgery. After receiving his M.D. from the University of Pennsylvania in 1839, he practiced medicine in New York before returning to his home state, Georgia, in 1841. As early as 1842, Dr. Long used sulfuric ether during the surgical removal of a tumor. He continued to use ether in operations over the next few years, but he failed to publish his results until 1849, after anesthesia was already heralded as a major medical innovation. 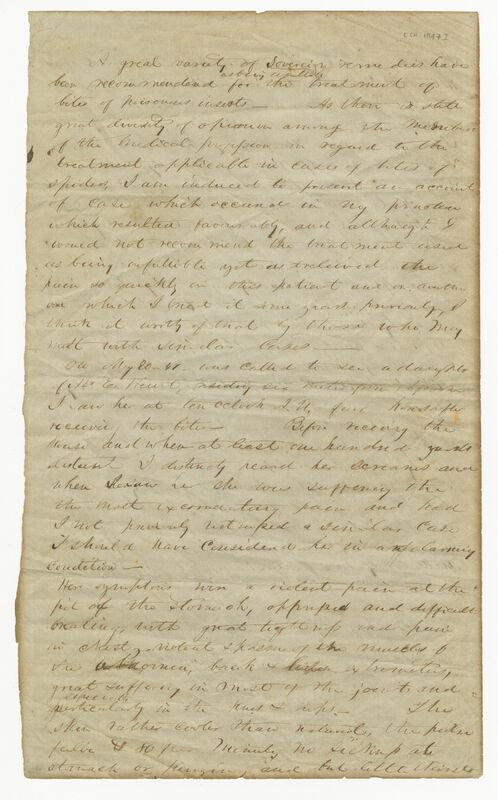 While Dr. Long is celebrated today for his innovative use of ether in surgery, the double-sided single-page manuscript from which this story was taken shows that he was also using popular ether-based medical remedies to treat common household ailments, such as insect bites. After the turn of the nineteenth century, ether was drunk in medical remedies in the United States and Europe and became a popular recreational drug in many European countries. 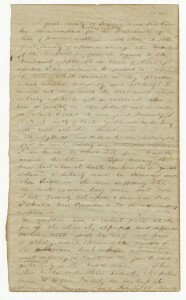 In this manuscript, Dr. Long reports that he successfully administered this treatment a second time and he was writing this account specifically because “A great variety of Sovereign remedies have been recommendend [sic] ^as being usefullest^ for the treatment of bites of poisonous insects”, but there was “still great diversity of opinion among the Members of the Medical profession”. Dr. Long’s narrative is also a good reminder to us that sub-divisions within the medical field were not as defined in the past as they are today: there was nothing wrong with a surgeon exploring pharmaceutical remedies. Further, the fact that he records in detail the household remedies his patient had already tried before he administered his own validates the possibility of their effectiveness, even if they were ineffective in this particular case, and it offers a good example of how diverse medical treatments were often intermingled. The College of Physicians of Philadelphia, MSS 2/0093-01, “Holograph remedy for poisonous insect bites, c. 1847”. This item also includes a typed donation letter from 1971 recording the provenance of the item. William Procter, Jr., “On Hoffman’s Anodyne Liquor”, American Journal of Pharmacy, 28, 1852, 213-18. W. M. Crawford, “An Account of the First Use of Sulphuric Ether by Inhalation as an Anaesthetic in Surgical Operations”, Southern Medical and Surgical Journal, 5, 1849, 705-713. Science Museum, “Ether”, http://www.sciencemuseum.org.uk/broughttolife/techniques/ether.aspx Accessed 11/9/2012.